In the final week of our video content marketing month, today's Video Worth Sharing features a video marketing funnel from a B2B SaaS company taking over the inbound world: Moz. Moz, previously known as SEOmoz, sells inbound marketing and analytics software to help marketers do their jobs more effectively. The brand has used video content for many years to stand itself apart from competitors and position itself as a leading industry expert. Most notably, its Whiteboard Friday is one of the most popular and long-running video series in the marketing world. So let's find out how they do it. Say hello to a heavyweight of the video content marketing world. 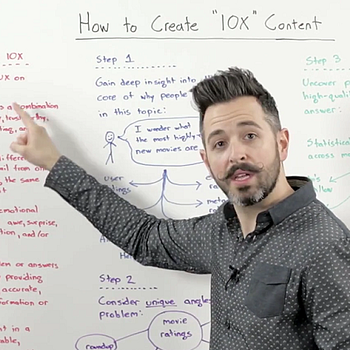 Whiteboard Friday is a top of funnel video series that's been educating marketers for close to a decade. It's what put Moz on the map and is constantly building brand awareness. Always insightful and rightly renowned. After being drawn in by Moz's educational content, leads are likely to want to find out more. So the brand created this 'About Us' video to show their culture and values to potential customers. We buy from people we like, which is why this type of video is strong consideration content. Before leads take the plunge and convert, they want to know the service they're buying will tick all the boxes they need it to. Tutorials or instructional videos like this prove just how simple Moz's tools are to use and how many useful features they contain — making purchase that much easier.